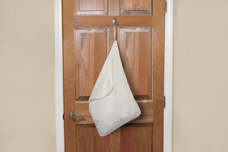 LaundrySafe ® travel laundry bags offer a simple and cost effective way to protect your laundry against bed bugs. Made of a lightweight stretch fabric that transfers directly to the washing machine, LaundrySafe® travel laundry bags protect you from bringing bed bugs home. Mattress Safe® LaundrySafe® travel laundry bags feature an innovative soft and luxurious yet breathable stretch knit fabric, carefully selected to be designed for comfort and easy care, while providing durability and protection for all applications. Bed bug certified, Mattress Safe® LaundrySafe® travel laundry bags have been tested by board certified entomologists and certified for protection against bed bugs and dust mites. You can travel safe knowing that bed bugs cannot penetrate nor escape through the stretch knit fabric of Mattress Safe® LaundrySafe® Travel Laundry Bags. The zipper and hook combination prevent bed bugs from entering or escaping, and quarantine infested items from spreading pests.